Let me start by saying, this story has a happy ending. Who would have thought that our first trip to the North American International Livestock Expo (NAILE) would take such a turn of events as a trailer full of stolen sheep. So a little background. My daughter is in the 4H sheep project. 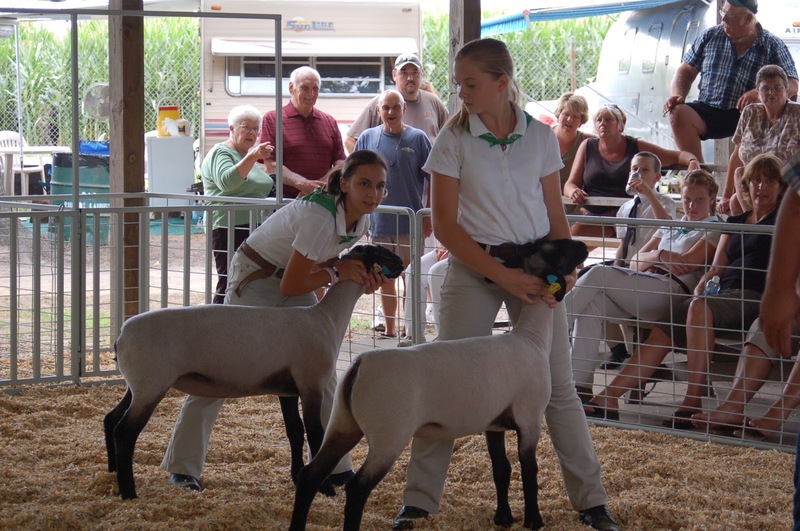 She exhibits sheep every year at several fairs and works with a local sheep breeder where she gets her show sheep. This year, in order to help expose her to the world of sheep showing outside of our region, we decided to attend this big livestock expo, not as exhibitors, but as shepherds. Our breeder, John Hall of Hall Club Lambs needed help getting his sheep ready for the sale at NAILE in Louisville, KY so my daughter and her best friend agreed to attend the expo and help John with the sale of his sheep. Louisville is 700 miles and a 12 hour drive from our farm. Since I only had 2 - 12 year old girls with me, and not being the best long distance driver, we drove 4 hours the first night and stayed at a hotel then drove the rest of the way the next day. Our breeder did the same thing, except he has a camper in the back of his pickup so he camped overnight in a parking lot in Morgantown, WV, about 5 hours from his farm. The next morning his truck didn't start so he called AAA for a tow to a repair shop. He had to unhitch the livestock trailer and leave it in the parking lot, which the business said was fine and something that contractors and other people did all the time. When he got back a little while later, his trailer with his sheep on board had been stolen. I can't imagine what went through his mind at the time. If it were me, I would have been sick to my stomach. He called me in Louisville to tell me what happened and I nearly was. How disgusting that someone would do such a thing. Long story short, on thursday I started tweeting out the stolen trailer license plate (thanks to all who retweeted by the way) and John sent an email to the sheep breeders association. We were both pretty much convinced that the trailer and sheep were gone forever. I mean, how do you find such things in the hills of West Virginia? On Saturday, a full 48 hours after the trailer had been stolen, a West Virginia farmer saw a trailer parked at a park & ride right off of I-79 south of Morgantown, about 3 miles from where the trailer had been stolen. He had been one of the recipients of the email that went to the sheep breeders association and so was aware that a trailer of sheep had been stolen in his area. Lo' and behold, he found the sheep on the trailer unharmed and in reasonably good condition! He got permission from the police to bring the trailer back to his farm so he could attend to the sheep. He fed and watered them and while they are all pregnant and due to lamb over the next few months, they all seemed to be in fairly good shape considering. It amazes me that someone would actually steal a trailer of sheep. The side slats were open, so any intelligent thief would have looked in to see that it was sheep, not motorcycles, not ATVs, not tools or equipment. Apparently, they either got wind that they were being looked for (who knows, maybe they were on twitter too), and got cold feet, or they got the trailer somewhere, and THEN looked inside and discovered it was sheep, NOT motorcycles, ATVs or expensive equipment. While we may never know why the thieves changed their mind, we are extremely grateful to the Hatton family of West Virginia for finding and tending the sheep until we could get John back to pick up his now repaired truck and the trailer full of sheep. The sheep are now home and recuperating from this saga. The Hatton family with breeder John Hall (on right) with recovered trailer & sheep. 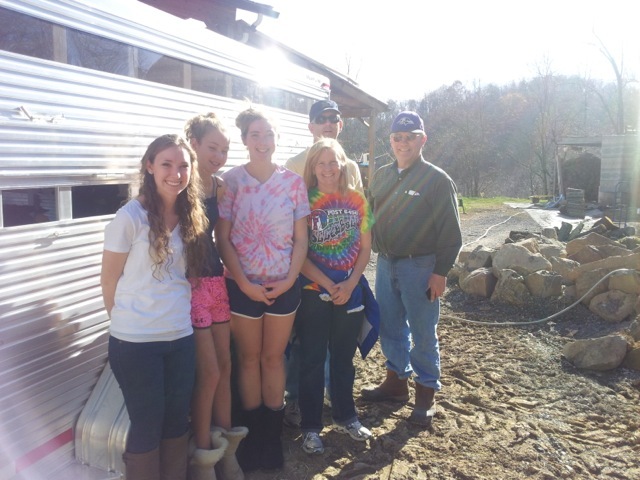 Thank you Hatton family for finding and tending the stolen sheep! The support and community of farm families around this country is awesome!